Life Is What Happens: Juice....? This picture is for the heading "liquid" in the photo scavenger hunt challenge that I'm in on Facebook. 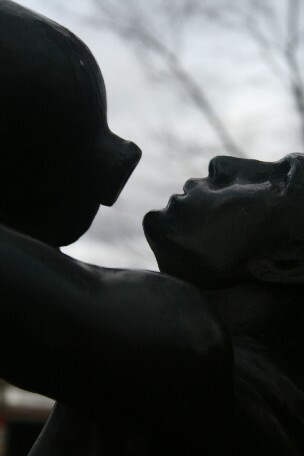 It is actually a close up of a bronze statue in a little parkette near where I work. The statue is called "harvester." I guess it is left to our imagination to decide whether it's just water that the labourer is harvesting from the jug or whether it's "the juice of the barley." Anyway, I think that the picture suggests that moment between thirst and when thirst is quenched and maybe his/our thirst never will be quenched. Will we ever really be "there"? The parkette is actually dedicated to two sculptors who lived nearby - here is their story with more pictures of the bronzes in the park. 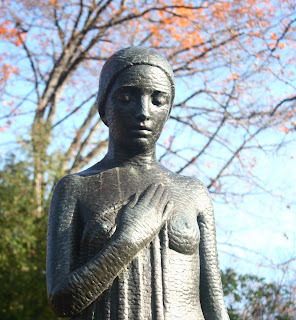 A few years ago, I used another statue in the park as a model for my Queen of the Earth shawl. Here is the statue entitled "Young Girl." and here she is wearing "Queen of the Earth" shawl. This picture was actually taken by my good friend Louise Whyte. I love it. I had to go back to the park today to retake the photo of the second statue. The first time, my batteries ran out - go figure. I guess that the business lesson here would be. Always keep your batteries charged and do the things that charge your batteries. It's all about the "juice."